What is the average salary for Ultrasound Technician? WORK ENVIRONMENT – Hospitals, Diagnostic & Medical Laboratories, Physician offices. An ultrasound technician or diagnostic medical sonographer works directly with patients, creating ultrasonic recordings of the internal organs of these individuals. Typical work environment is a darkened room within a healthcare facility. These individuals provide physicians with these sonograms and either a written or oral summary of their technical findings. This requires determining which images are suitable for diagnostic purposes and identifying differences between pathological and healthy areas. Physicians then use the information to make a medical diagnosis. Hospitals employed approximately 59 percent of U.S. ultrasound technicians. As of 2018, the Bureau of Labor Statistics reported 53,010 people employed in this field with a mean annual wage of $64,900. Highest ten per cent had a salary of $88,940. Employment services, colleges, universities, and professional schools, and outpatient care centres were the top-paying industries. California, Florida, New York, Texas, and Ohio had the highest employment level for ultrasound technicians. Massachusetts, Oregon, Colorado, California, and Washington were the highest paying states, with annual mean wages of between $77,190 and $80,000. The lowest paying states were Alabama, Mississippi, Louisiana, West Virginia, Tennessee, South Dakota, and Michigan. Employers prefer ultrasound technicians with a formal education from an accredited program or those who have completed training within an accredited practice, as well as individuals who are registered. Due to its less harmful nature, sonography is becoming a preferred alternative to procedures involving radiation. This is spurring employment growth to be faster than average and creating favourable job opportunities. The Bureau of Labor Statistics predicts an 18 per cent growth rate from 2008 through 2018. Ultrasound technicians may specialize in areas like cardiac, vascular, breast, nervous system, abdominal, or obstetric and gynecological sonography. There are multiple ways to enter this career field, including training, formal education, or a combination of the two. Training is provided by colleges, universities, hospitals, and vocational-technical institutions. College and university programs run for two or four years, leading to an associate or bachelor’s degree, respectively. 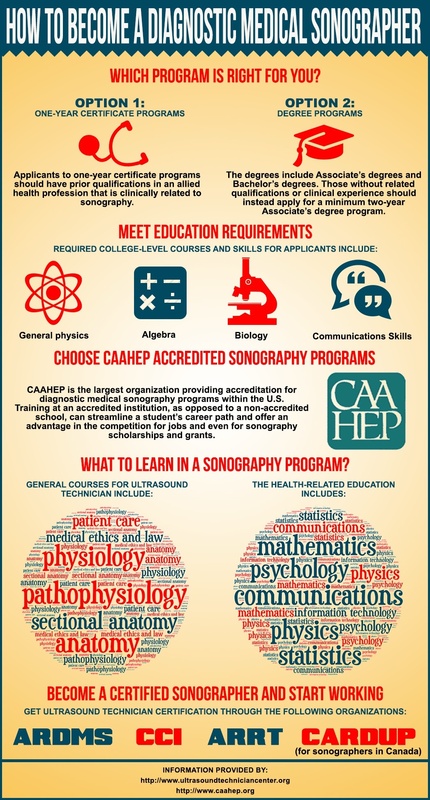 As of 2018, over 150 ultrasound technician training programs were accredited by the Commission on Accreditation of Allied Health Education Programs (CAAHEP). The Bureau of Labor Statistics and a survey conducted by O*Net report that most people entering this field have completed a two-year program. An additional 25% attend some college but do not have a degree. One-year certificate programs are also viewed by employers as acceptable for individuals already employed within the healthcare field. Licensure is not required by any state in order to practice as an ultrasound technician. Employers prefer registered technicians and registration is accomplished by taking an examination that has certain prerequisites. Exams usually include a physics and instrumentation assessment within a technician speciality. The exam provided by the American Registry for Diagnostic Medical Sonography (ARDMS) leads to the Registered Diagnostic Medical Sonographer (RDMS) credential. Vascular and cardiac sonographers may obtain additional credentials through the ARDMS. Breast and vascular sonographers will find credentials through the American Registry of Radiologic Technologists (ARRT) and cardiac sonographers should contact Cardiovascular Credentialing International for credentialing options. Continuing education is usually required to maintain credentials. You have to run a comprehensive and exhaustive evaluation of the each academic institution and examine most of the necessities that you’ll need to satisfy so as to procure job in this area, before you cough up one cent to any college to learn to become an ultrasound tech. You should take total responsibility and possession over your profession, your daily life along with the choices that you make. Becoming an ultrasound tech or medical sonographer could be very frustrating because of the problem in browsing on the web all of the advice you can read. Many universities will make an effort to deceive would-be pupils by promising they’ve been accredited by such-and-such bureau. The fact of the point is the fact that some of those certifications are unimportant and worthless to you the would-be pupil. I might even go as far as to mention that some accrediting organizations are purposefully set up as self serving advertising ploys by some for-profit schools to defraud pupils. For all those aspiring to become ultrasound specialists, it is critical that you attend a college that’s accredited from the CAAHEP. Don’t mistake the certification a college receives as complete with all the certification bestowed upon a certain health instruction plan from the CAAHEP. Even reliable schools having reputable certification by a good-understand organization might lack CAAHEP certification for his or her unique diagnostic medical sonography plan. The American Registry for Diagnostic Medical Sonography and Cardiovascular Credentialing Worldwide are a couple of the very reputable credentialing businesses for ultrasound specialists. Although there presently are no regulations requiring health-related sonographers to possess a licensing qualification, the market is getting increasingly aggressive and employers are demanding this added appointment. There are a couple of distinct manners people can become an ultrasound tech and enter the medical sonography subject. The duration of the program depends on the degree or certification granted and is additionally determined by your previous academic and professional qualifications. High school grads would pursue the 2-year program (or the four-year program should they want) with the one-year program allowed for those pupils satisfy specific qualifications in a clinically associated allied health profession. High school grads will be expected to have finished fundamental science and physics classes in addition to algebra. Accredited programs will expose pupils to physical sciences, applied biological sciences, patient care, clinical medicine, uses of ultrasonography and picture assessment. Some people already having a bachelor degree can elect to forego the 2-year choice and attend an one-year program. In addition to meeting your instruction part, ultrasound technicians must finish 1,680 hours of clinical ultrasound/vascular expertise. This expertise can be obtained through paid employment or earned through the end of a proper ultrasound/vascular plan. Please notice that these hours must be documented. These work experience hours are required for virtually every applicant wanting to sit for the ARDMS exam. Those already owning a bachelor degree may be able to prevent the 1,680 hour prerequisite and promptly sit for the ARDMS examination. In Ca and many other areas, schools offering accredited programs in diagnostic medical sonography are severely affected with extensive waiting lists. This can be significantly frustrating with some pupils electing to attend a forprofit school lacking programmatic certification. Others only see adverts for 14-month programs and the like and consider that they can take shortcuts. While you can still become an ultrasound tech and attend a non-accredited school you need to be vigilant and watchful of a couple of things. Many ultrasound techs are surprised to discover once they graduate from a non-accredited school that it is really hard to locate full-time employment. Nuclear medicine technologists administer substances called radiopharmaceuticals to patients and monitor the functions and characteristics of organs or tissues into which these drugs localize. Cardiovascular technologists assist physicians in the diagnosis and treatment of blood vessel and heart conditions. Radiologic technologists conduct diagnostic imaging exams like magnetic resonance imaging, x-rays, mammography, and computed tomography. diagnose, and treat diseases is the job of the clinical laboratory technologist.